This first day of Hajj is known as Yawm al-Tarwiyah (the Day of Quenching Thirst). It was given this name because on this day, the early pilgrims were instructed to drink a lot of water and fill their containers in preparation for the long journey ahead. They would also make sure their animals were properly fed and had consumed enough water to allow them to travel to their destination. If you are performing Hajj al-Tamattu, you would have taken off your Ihram garments after having completed Umrah. It is Mustahabb (recommended) that you take a shower, cut your nails and trim your moustache prior to wearing the Ihram garments. Women are free to wear what they please although clothing should be normal modest Islamic dress with a head covering (scarf) of any colour. Hands and faces must be uncovered. You will then perform two Rakats of Nafl Salah, pronounce a new Niyyah (intention) for Hajj, recite Talbiyah and enter into the state of Ihram before the morning of the 8th of Dhul Hijjah. It is Mustahabb to carry this out at Masjid al-Haram, although it’s also perfectly acceptable at your place of residence. Please note, you don’t have to travel to the nearest Miqat (Masjid Aisha) in order to enter into Ihram. If you are performing Hajj al-Qiran or Hajj al-Ifrad, you will already be in a state of Ihram as you did not leave Ihram after having performed Umrah. You may take a normal shower, ensuring you don’t violate the restrictions of Ihram i.e. use scented products etc. You will then proceed to Mina via coach before the time for Dhuhr has come in. It is a Sunnah to leave for Mina on the 8th of Dhul Hijjah after sunrise as was the practice of the Holy Prophet ﷺ. Recite Talbiyah frequently during this journey. Please note, it is the usual practice of tour operators to take groups to Mina after Isha Salah the night before. If you can travel to Mina on the morning of the 8th of Dhul Hijjah by a coach organised by your tour operator or Mutawwif, you will have completed a Sunnah. You may also walk from Makkah to Mina if you wish to do so. The walk begins from the pedestrian tunnels which are located between Safa and Marwa, taking you directly to the Jamarat in Mina. Once you’re in Mina, your camp may be at the far end, which will require further walking. You will be able to manage the walk (it is about 8 kilometres (5-6 miles) to the camps, taking approximately 2 hours to walk) and it will not affect your Hajj later on. The person leading the walking group knows his way to the camp. You take into consideration the welfare and safety of any women travelling with you if you are a Mahram. You are accompanied by your husband / Mahram if you are a woman. It is imperative you don’t leave with a walking group without your husband / Mahram. You stay close to your group, otherwise, the chance of getting separated is very high. It is also advisable not to travel by taxi or private coach as it may prove difficult for the driver to get to the camps, especially since there are various checkpoints that need to be crossed. When you arrive in Mina, you will be struck by the fact that everything looks the same, so you must be careful not to get lost. Acquaint yourself with the area around your camp and identify some distinguishing landmarks so you know your way back to the camp. You will stay in Mina for the full day and part of the following day (9th of Dhul Hijjah). After you have settled down in your tent, you will perform Dhuhr, Asr, Maghrib and Isha prayers in Qasr form i.e. you will shorten the prayers as if you were a traveller. The shortening of the prayer is applicable to everyone, regardless of whether the individual is a resident of Makkah or not. During your stay in Mina, spend your time in prayer and supplication. You will spend the night of the 8th of Dhul Hijjah in Mina. With this, your first day of Hajj has been completed. 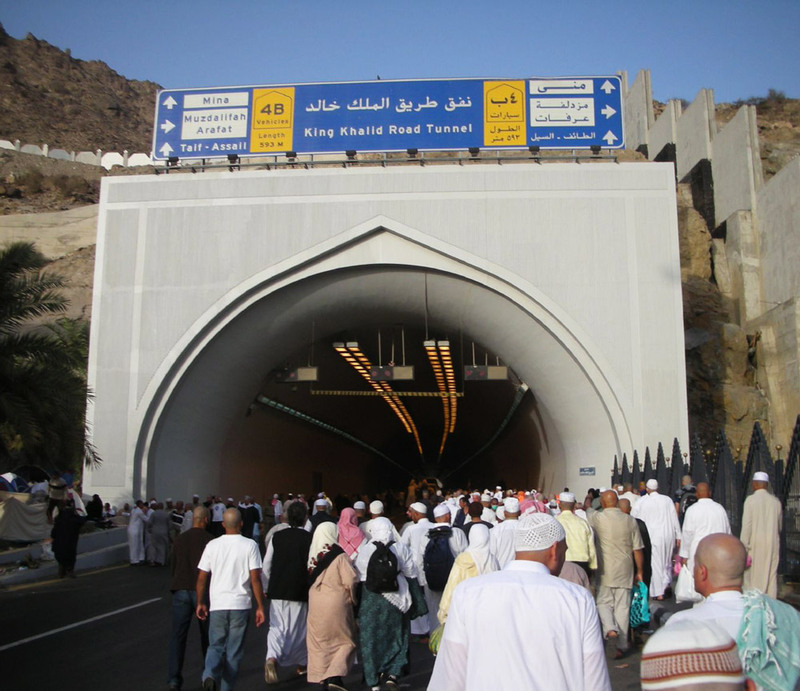 Mina is situated east of Makkah Mukarramah, with its boundary starting about 3 miles away from Makkah. It is approximately 20 square kilometres in size. 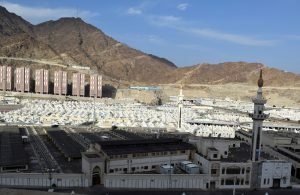 The camps of Mina are approximately 8 kilometres (5-6 miles) away from Makkah. 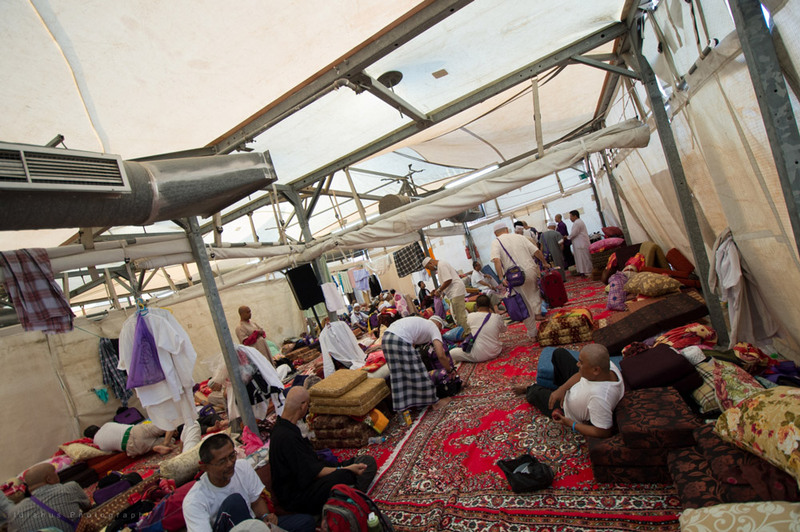 During Hajj, there are more than 100,000 air-conditioned tents in Mina, which provide temporary accommodation for pilgrims. 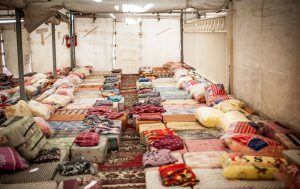 Mina is known as the “Tent City” due to its vast amount of tents. Pilgrims in Mina are divided into groups and their accommodation is pre-allocated according to the country they’re from. Streets and camps are numbered, so learn your camp number or note it down somewhere. 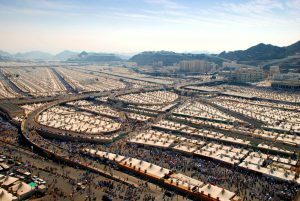 Before 2000, tents in Mina were small and basic. However, after a major fire broke out in Mina in 1997, taking the lives of over 200 pilgrims and injuring many more, they were replaced with fireproof tents which have air-conditioning, electricity, lights, electric plugs and are on the whole, comfortable. 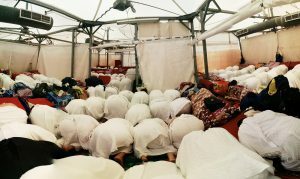 However, the comfortability of your particular tent really depends on your Hajj package. We have seen some tents which are extremely busy and cramped, so it’s best to check with your agent if you’re unsure about anything. 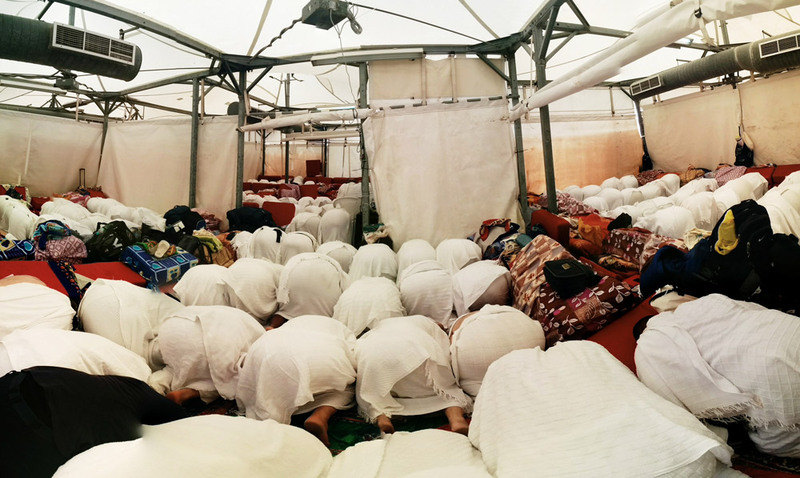 Men and women normally stay in separate tents in Mina. Hajj packages normally provide food for the days of Hajj, but you may have to pay a little extra if it wasn’t included in your original package. There are a number of shops to buy food from in Mina, although the price of everything doubles during the Hajj period so be prepared to pay extra. It is generally a good idea to keep biscuits, dates, fruits and water with you. Ensure you drink plenty of water to keep hydrated as it can get very hot in Mina. It’s advisable to keep some sweets to provide you with some energy when you need it. You will also have access to tea and coffee areas. This is where you can make use of your inflatable air mattress or sleeping bag if you have purchased one. If you haven’t got an air mattress, a straw Hajji mat can be purchased and used to sleep on. 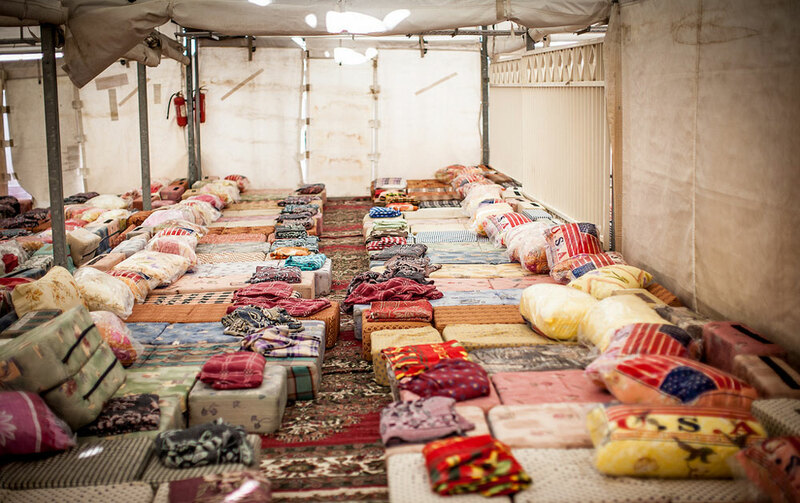 Some of the tents in Mina are also carpeted. 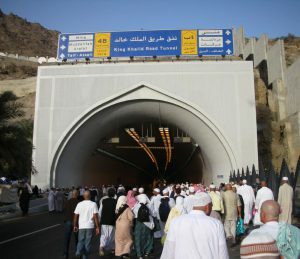 You will notice many pilgrims sleeping in all sorts of places in Mina – on the streets, under bridges, in the tunnels and even on top of the mountains. 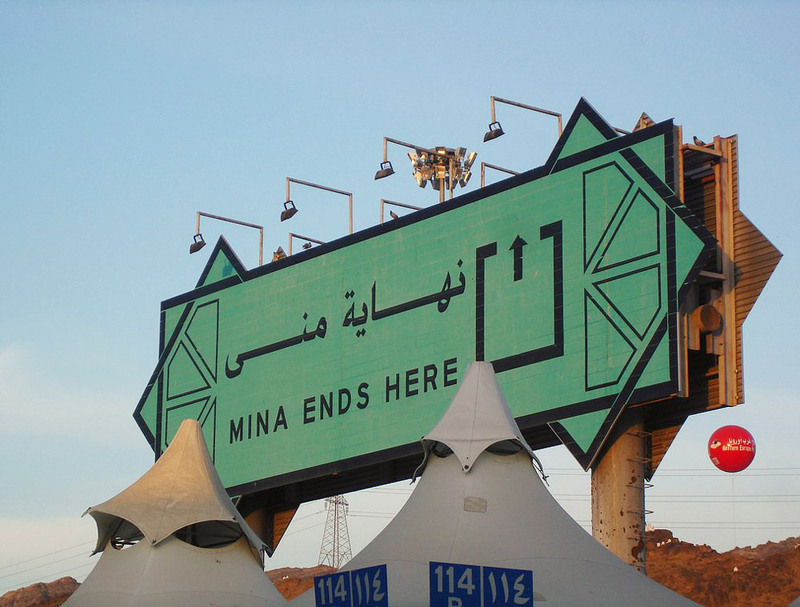 You must ensure you remain within the specified boundaries of Mina during the 10th, 11th, 12th and possibly 13th. The boundaries for Mina are indicated by large green signposts. It is sometimes the case that camps are situated in Muzdalifah, outside the boundary of Mina. If your camp is located outside the boundary, it is important that you inform your tour operator, as you have paid for arranging your accommodation in the correct location. However, avoid getting into an unnecessary argument with your tour operator if this is the case. If you want to go to this Masjid, make sure you know your way there or go with someone that does, otherwise you may end up getting lost. In the south of Mina, there is a hospital just opposite Masjid al-Khayf. There is an additional hospital near the old slaughterhouse as well as various mobile clinics throughout Mina. All the camps in Mina have shower and toilet facilities. The toilets have been combined with shower facilities, which provide water 24 hours a day. Public telephones are available in Mina, but again, they can become very crowded. These public telephones use phone cards, which can be purchased in a variety of denominations ranging from 10 to 100 Riyals and above. You can also purchase a mobile phone card, with a minimum charge of 100 Riyals. Perform two Rakats of Salah. Make your Niyyah for Hajj and recite Talbiyah, preferably at Masjid al-Haram. Proceed to Mina before Dhuhr. Perform your Dhuhr, Asr, Maghrib and Isha at Mina. Jazakallah! This was very helpful for us and it gave us so many answers we were looking for. May Allah reward you for this information, In Sha Allah. Shafik and Ferida Ismail (USA).